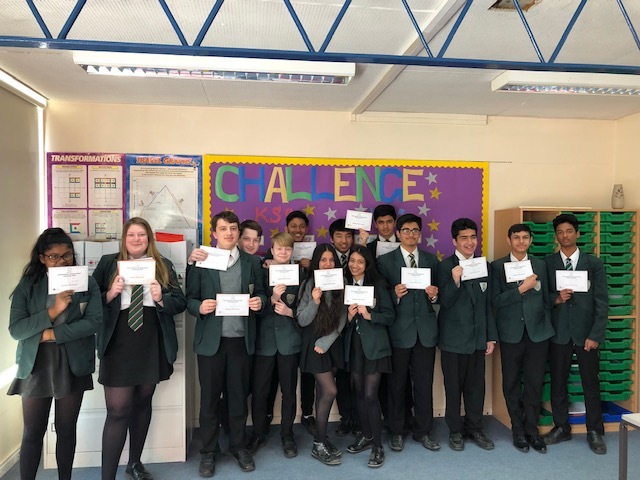 In February, 39 students from Year 11 took part in the UK Intermediate Maths Challenge. The results and certificates recently arrived, giving students the opportunity to celebrate their successes.This year we had several medal winners, including 3 Gold, 6 Silver and 11 Bronze. Two students, Sarah and Bhavik reached the next round(Kangaroo qualifier) and Avon also achieved a Gold. It gave all students the opportunity to push their Maths problem solving skills at a high level and enabled them to appreciate the use of Mathematical problem solving in a variety of interesting contexts. We look forward to entering more students for Maths challenges as they progress through the school.